BANAL, ALLANIC STOP THAIS IN TAGBILARAN! TAGBILARAN CITY--ALA Boys Alex John Banal and Robert Allanic both lived up to their lofty billings as they stopped their Thai foes in the co-mainers of the 'Stars of the Future' card here last night. The event, which was covered live by Solar Sports, was presented by this city's Mayor Dan Neri Lim, Oscar De la Hoya's Golden Boy Promotions, and Sammy 'Don King' Gello-ani's SGG Promotions. At ringside was WBO Asia-Pacific chairman Leon Panoncillo, who is heavily credited for giving opportunities to Filipino boxers. 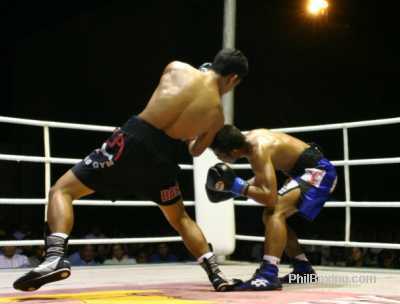 AJ Banal drives Thai opponent Bangsaen Sithpraprom to a corner before the fateful end of the contest in the 2nd round. Banal, who is being eyed by executives of the Golden Boy Promotions as their next contract fighter, took away Thai Bangsaen Sithpraprom with a big left at the 2:15 mark of the second round to improve his unblemished record to six wins in seven fights with just one draw and five knockout wins. "The surprising thing about Banal's win is that it took Gerry Penalosa seven rounds to stop Sithpraprom in 2004, now Banal only did it in two rounds," beamed promoter Sammy 'Don King' Gello-ani. 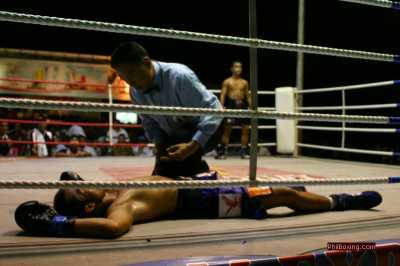 Bangsaen Sithpraprom lie flat on his back after being hit by a wicked left to the jaw by AJ Banal and was counted out by Referee Teddy as Banal waits in a neutral corner. Robert 'Cliff Smart' Allanic, the country's no. 1 superfly, figured in a pier 6 rumble with Thai Saensak Singmanasak but found a way to solve the puzzle with a big left to the body in the sixth to send the Thai for the first time on the canvas. Allanic then followed it up, crowding the Thai who again went down only to beat the count. 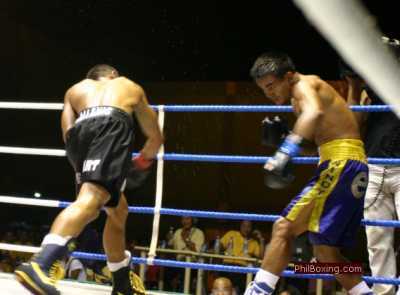 Allanic upped the tempo in the seventh, knocking down Singmanasak again in the seventh, as referee Teddy Alivio waived the fight off at the 1:19 period of the round. Allanic hits Singmanasak with a right cross that sent Singmanasak to the canvas for the first time in the 6th round. ALA Boy Rey Caitom continued his winning rampage, as he bucked a fourth-round cut en route to earning a workmanlike 60-53, 60-53, 60-54 unanimous decision over Roldan Malinao in their 8-round tiff. The win improved Caitom's record to six wins in as many outings, with two KO's to his credit. Wonder boy Milan Milendo, fighting like an ALA Boy, also bucked a fourth-round cut to outpoint Amirro Ricablanca, 60-53 (twice) and 60-54. ALA Boy Ninolito Jalnaiz, however, run into a tough-as-nails Jessie Albarracin, earning a hard-earned majority draw with the Davao City slugger. "I want to have a rematch," said Jalnaiz, seemingly unimpressed by his own performance. OTHER RESULTS: ALA Boy Frank Albia prevailed on a unanimous decision over Brix 'Bomb' Ray; Mark Jason Melliguen stopped Rolan Malunhao with a big left to the head for a fine first-round TKO win; Rashid Bacus earned a unanimous decision win over Argie Marapao; Rex Malibago won by TKO over Daryl Amoncio in the opening round; while Rogen Flores figured in a second-round technical draw with Rey Taguibalos. Photos by Dong Secuya / PhilBoxing.com. All rights reserved. Click here to view the complete photo gallery of the "Stars of the Future" event.